Of course, there is always that last sewing job to be done in a complete rush before Kentwell. This was made every evening in the fortnight leading up to Kentwell and approved on site – this is a bit of a risk! Also, I hadn’t quite finished as the skirts weren’t attached, so it was provisionally approved for this year [as a kind of sleeved pourpoint] and needs skirts adding for next year to be a true doublet. This doublet is in a very simple style as DH was a builder this year, and so not for the peascod or pointed design. 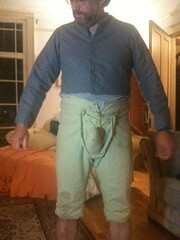 Also, I am hoping that he can wear it in earlier years as well if necessary – though I will wait to see at the time! Due to migraine, there are also no making photos as such, as I was just in get-it-done mode! It is mostly made in a similar way to the girls waistcoat except that the arms were in 2 parts – so a seam at both sides, and the front panel and back panel meet in a straight line under the arm, rather than the nice curvy look for the waistcoat. So first I made a rough toile using the pourpoint and then fitted this against DH [he isn't keen on being toiled very much!] 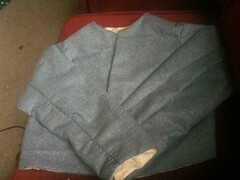 and sewed the back panel right side to right side as previously, leaving the bottom [waist] unsewn to turn round. there was no extra stiffening in the back. For the front panels, there was also an interlining of stiffer canvas so that it would hold the shape nicely without creasing – akin to the panels in the girls kirtle bodices again right side to right side, backstitching all the way round, trimming excess at the seams and cutting v on the curves so it sits nicely, leaving the bottom edge unsewn. i tacked all the panels together, fitted on DH and made minor adjustments so it sat well across the back, and also so the neckline was better. Then, as before, I used whipstitching for the linen-linen join of the panels and ladder stitch for the wool-wool join of the panels in the straight underarm seam and the shoulder seam. At this point the lower ‘hem’ is unfinished all the way around. Second job was the sleeves. Having read, begged for easy answers, given mathematics and decided I was too brain-fuzzled by analgesics, I did a toile sleeve just as before with the girls waistcoat. 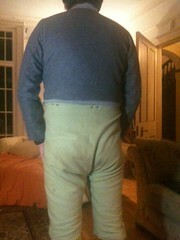 One armhole was slightly bigger than the other, so I had a definite right and left sleeve. 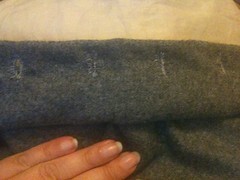 As you can see from the picture below, the sleeves were definitely in 2 this time, with the seams coming off at the mid point at front and back. Unfortunately I sewed the sleeves up so that they were the wrong way entirely and so i didn’t realise putting the slightly bigger right sleeve head into the slightly small left armhole, and then did the right armhole and realised i would need to take everything down, undo the sleeves, turn them so that I sewed the linen onto the other side, to make them fit the other armhole etc etc [you need to understand sleeves i think to follow this despair] and so decided to make a small triangular bodge. You cant see it can you . job’s a good’un. 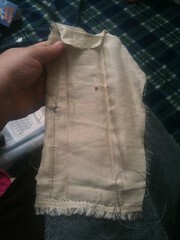 Added a photo of the inside of the sleeve with the aide memoir I ignored! Using the hose to show the tudor waist, I then realised DH had developed a natural peascod over the winter, and the hose rode low at the front! this was a bit of a problem, as had sewn up the bottom of the doublet – a mistake – and very little inside leeway to extend at the middle. However, I did manage to get some additional length – about a 3cm to the centre- and plan for the skirts when attached to hide any separation. SO here you can see the doublet off and folded, and from the crease, how much I managed to extend at the front downwards. 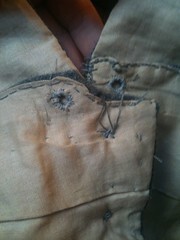 I made some very nice and neat buttonholes, and then made some buttons out of fiddly material as self – the tudor way. I am sure I took pictures! but 10p piece were about the right size starting circle. DH made the eyelets around the bottom so that he can lace to his hose if he wishes too. 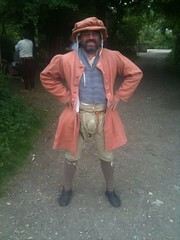 I ran out of time at that point, so it was worn unskirted at Kentwell – I think he looks rather fine though. Now I have scraps only of grey wool and beige linen, so I am piecing together these as best as I can to make as wide skirts as possible. They are still more in the ‘you cant go out with that skirt, it is more like a belt’ range, but hopefully, when done, will look the part! 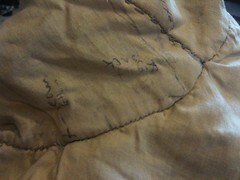 here is one of the pieces, which is sewn right side to right side and then turned out. The front bits had only small pieces at the side, and the back was in more pieces! You can see how the inner cross over was curved around the eyelet, so one eyelet to each side and easily done. 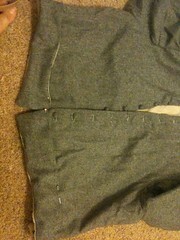 [the pic is with the skirts at the top] and the final pic is just as I sew the skirts on. These go above the line of the eyelets, and where whipstitched linen on and then ladder stitch wool so that the beige lining isn’t seen.